The best oils for deep frying. We use a Deep Fryer often here at My Keto Kitchen for a variety of our low car recipes. Everyone here has a Home Deep Fryer that is suitable for small families. Chef also uses a Commercial Deep Fryer as she tends to cook for larger groups and dinner parties more than the rest of us for that she always uses oil that does not solidify such as Peanut Oil. We pressed her on what the best oil for deep frying is. Consider a cooking oil with a high smoke point. High smoke point cooking fats make the best oils for deep frying, as the temperature that you deep fry at is very important. The best frying temperature is between 170°C/340°F and 190°C/375°F. Lower cooking temperatures will cause the food to soak up oil, and higher temperatures will burn the food before it is cooked through. She keeps her deep fryer set at 180°C/355°F for best results. Another thing to consider is price. 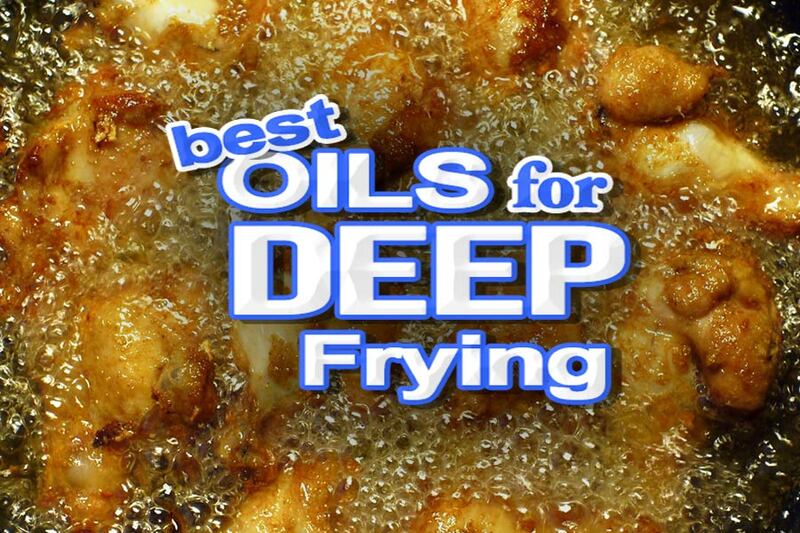 Deep frying requires a large volume of oil and some oils simply aren’t practical to use in a deep fryer. Do not use fats that solidify when cool in deep fryers with submersible elements. That means lard, tallow, coconut oil etc. There are inexpensive alternatives here or at the bottom of this page. Gas powered commercial deep fryers are generally fine if you’re unsure check your product manual. If you’re looking for a fat that fits right in with a ketogenic diet, tallow along with lard, are your go to fats. Tallow is rendered beef fat and it is perfect for LCHF diets. It has a high smoke point of 400°F/250°C. Tallow is also high in Vitamin D which is great for your bones. Beside the proven benefits of saturated fats in low-carb diets, food fried in tallow just tastes great. Tallow is high in CLA (omega-3’s) which has been proven to reduce incidences of heart disease and protects against cancer. Tallow is high in vitamin A, vitamin D, vitamin E and vitamin K.
Tallow is 42% monounsaturated fat, 4% polyunsaturated fat and 50% Saturated fat (the notion that saturated fat is bad is wrong in a LCHF diet and has been proven so, see references below. People on low-carb, high-fat diets usually see a marked improvement in bad cholesterol and triglyceride levels or at least no change at all). All of the above-stated facts are what tips Tallow slightly in front of Lard as the best oil for deep frying in our mind. That low polyunsaturated and near 1:1 ratio of Monounsaturated and Saturated fats makes it great for LCHF cooking. Lard is rendered pig fat. After tallow, we consider lard the next best oil for deep frying and shallow frying. 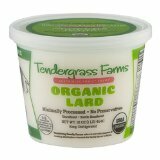 Lard consists of 39% Saturated fat, 45% monounsaturated fat and 11% polyunsaturated fat. It has a high smoke point of 374°F/190°C slightly less than Tallow. The smoke point is why we rank it just behind tallow as best oil for deep frying. We’ve found that due to its higher smoke point that we get a slightly crispier result from Tallow and that it seals the food quicker. Lard contains oleic acid, the same found in olive oil. Oleic Acid is shown to lower LDL (bad) cholesterol. Lard is somewhat less expensive than Tallow. Lard is neutral flavored. It does not infuse the food your cooking, with any taste like some oils like coconut oil might. Tip: Get non-hydrogenated lard if you can afford it as its healthier for you. In saying that, I would use hydrogenated lard over vegetable and seed oils every day of the week, so don’t panic. Hydrogenated lard most often contains less than 4grams of trans fat per 100g, when used for deep frying you consume hardly any of that. Peanut Oil is certainly the most popular and most cost effective oil for deep frying. But its nutrition profile doesn’t get near Tallow or Lard as the best oil for deep frying. When cooking at the very high heat Peanut oil is capable of, very little of that Omega-6 is transferred to the food being fried. Peanut oil is fine to deep fry with, that’s all we use it for though. Peanut oil is 17% saturated fat, 46% monounsaturated fat and 32% polyunsaturated fat. We certainly wouldn’t use peanut oil in a frying pan at lower temperatures or over a salad, but it is the best oil for deep frying and a cost-effective “alternative” to animal fats. Does not transfer any flavor to the food you’re cooking. Has a very high smoke point of about 450 degrees Fahrenheit (230 degrees celsius). Can be used over and over for many meals as it does not absorb any of the flavor from the food being cooked. Has a neutral taste, it doesn’t taste like peanuts. 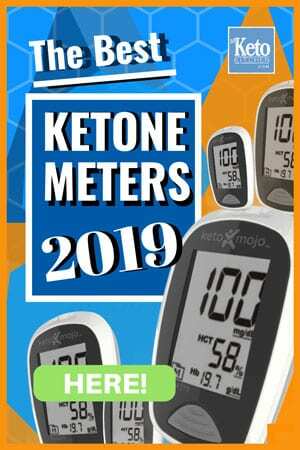 Coconut Oil can be used for deep frying, it’s an excellent oil and you won’t read a ketogenic or LCHF diet forum that doesn’t mention its powers. Coconut oil is very high in saturated fats and has a high smoke point. But it is expensive and does have a strong coconut flavor. We leave coconut oil away from deep frying and keep it as an ingredient in things like fat bombs or shallow frying, along with butter. But hey, you can do as you please, coconut oil has some fantastic benefits as both a cooking oil, recipe ingredient, by the spoonful or even to moisturize your hair and skin. The one drawback from using oils such as lard, tallow or coconut oil is that they set solid. Due to this you cannot use them in deep fryers with a submersible element like the common deep fryers you may see such as this Tefal. What you want to look for is a Deep Fryer with the element sealed or underneath the unit (so no fat/oil comes in contact with the element). Your Deep Fryer should look like this on the inside, with no element visible for cooking with fats such as lard, tallow or coconut oil. 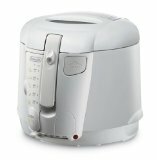 This Delonghi Deep Fryer is perfect. 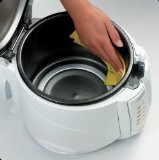 Its easy to clean and easy to empty. I own the Delonghi deep fryer above. But we’ve used this simpler more versatile option that we like as well, as it can be used for other cooking applications such as steaming and heating. While Extra Virgin Olive Oil and Flaxseed Oil are fantastic for your diet, they shouldn’t be used for deep frying. These oils oxidize and form free radicals at high temperatures so are best served at much cooler temperatures (cold for flaxseed). You will also want to avoid oils dominant in “processed” polyunsaturated fats and high ratios of Omega-6 fatty acids. Most modern diets contain oils such as processed sunflower oil, soybean oil, and corn oil, these oils more often than not are processed polyunsaturated fats and have far too high a ratio of Omega-6 fatty acids to Omega-3s. While we need an even ratio of Omega-6s to Omega-3s most modern societies consume way too much Omega-6 fatty acids and not nearly enough Omega-3s. The ideal ratio is 1:1 the average western population is about 16:1 which has many many health consequences. Peanut oil teeters but is fine for deep frying as you consume very little of the bad stuff when cooked at high temps. You wouldn’t drizzle it over your salad though. Your aim is more saturated fats and omega-3 fatty acids, “natural” polyunsaturated fats, monounsaturated fats and “natural” trans fats. How about coconut butter? I use Coconut cooking butter enriched with omega 3 hempseed oil by Tiana. Coconut Butter unlike Coconut Oil is made from the pureed meat of the coconut and isn’t any good for deep frying, unfortunately. Is ghee alone, or mixed with virgin coconut oil, good for deep frying? Ghee tends to be a use once and throw away fat when used for frying at high temperatures. It is also quite expensive and if it hasn’t been clarified properly the remaining water content tends to make it foam. So we wouldn’t use it or with coconut oil either. How about duck fat or is it a one time usage? Where do mustard and rapeseed/Canola stand? They don’t make the Best Oils list. Mustard Seed Oil is very high in Omega 6 Fatty Acids and can be quite expensive, it has a high smoke point but we wouldn’t use it for deep frying. We don’t recommend Canola Oil in any form as it is a very overprocessed oil. Chemicals are used to extract the oil and then bleach it. I suggest watching the “how it’s made” video on Canola oil if you’re interested in learning more. Thank you for this very useful article! 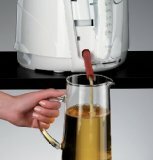 I have just bought a deep fat fryer and now have to find the right oils to use in it! I have goose fat (but not enough to fill the fryer – but i can buy some more!) Would that be like the duck fat? Duck fat and goose fat are very similar and both have great flavor. Enjoy your deep fryer! Could you use a conventional fryer if you warmed the lard or tallow in an oven to liquify it? I wouldn’t recommend it, but if you are keen to experiment, please let us know how it goes.